Copper (Cu) is a ductile metal that’s an excellent conductor of electricity. For this reason, more than half the world’s copper is used in electrical motors, wiring or anything that requires electricity. Global demand drives the price with emerging markets playing a significant role. China, in particular, has seen a large increase in copper consumption due to urbanisation and strong economic growth. The world’s primary market for copper trading is the London Metal Exchange (LME). The CME Group (COMEX) Futures, however, are the most quoted benchmark online, with prices displayed in $US per pound. Australia holds about 13% of the world’s copper resources which is second only to Chile (25%). The largest domestic resources are at Olympic Dam (SA) and Mount Isa (QLD). Australia holds 13% of the world’s copper resources which is second only to Chile (25%). The largest domestic resources are at Olympic Dam (SA) and Mount Isa (QLD)  View an image of Australia’s 2016 copper deposits and operating mines. Download a spreadsheet of the official copper price (USD/tonne) since 1978. 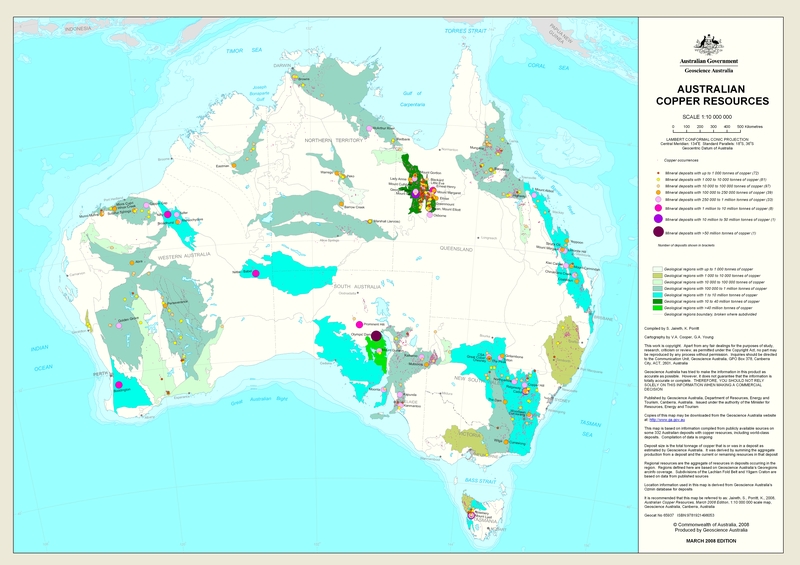 A huge 8MB image with all Australia's copper deposits.